England baseball cap with the adjustable Velcro strap. 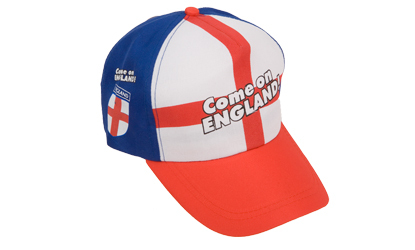 The England baseball cap is the perfect hat for England supporters abroad, keeping the sun from your face and preventing you from looking like a baked tomato while yelling support. Be seen, support England and protect yourself from the heat of the mid-day sun with this red and white England baseball cap. Face it, the last thing you really want is heat stroke at a match! I mean, you wouldn’t let beer stand out in the sun for a whole day would you? • Colour red, white and blue with St George shields transfers on sides with the words Come On ENGLAND!